Cora Sheibani's "Decorated Gugelhupf" 18-karat rose gold and ruby-studded ring is inspired by the beloved European cake that's traditionally baked in a sculptural, multi-tiered Bundt mold. 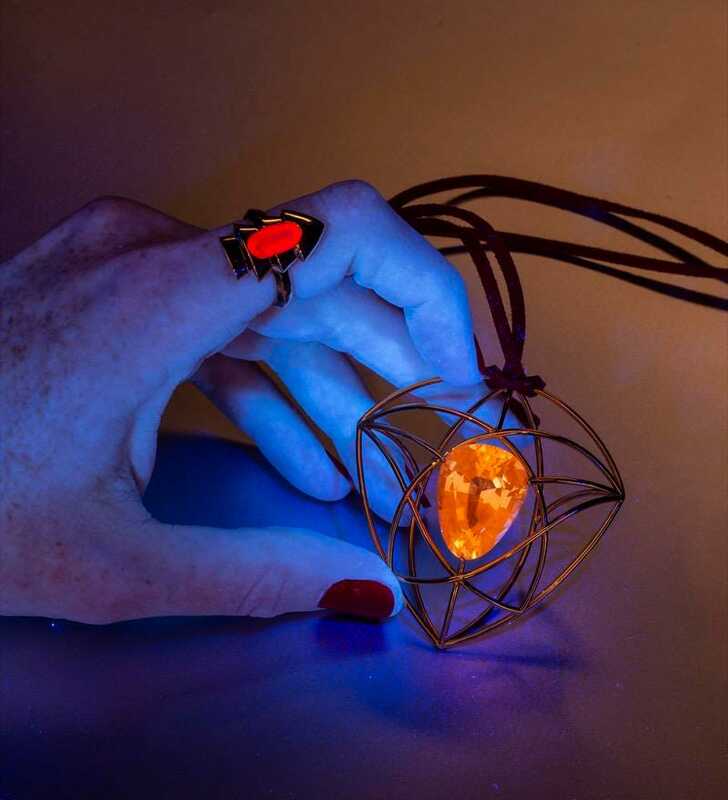 The luminous ring is on exhibit in Sheibani's show, Glow: Jewels That Fluoresce, until April 30, 2019 at London's Louisa Guinness Gallery on Conduit Street. 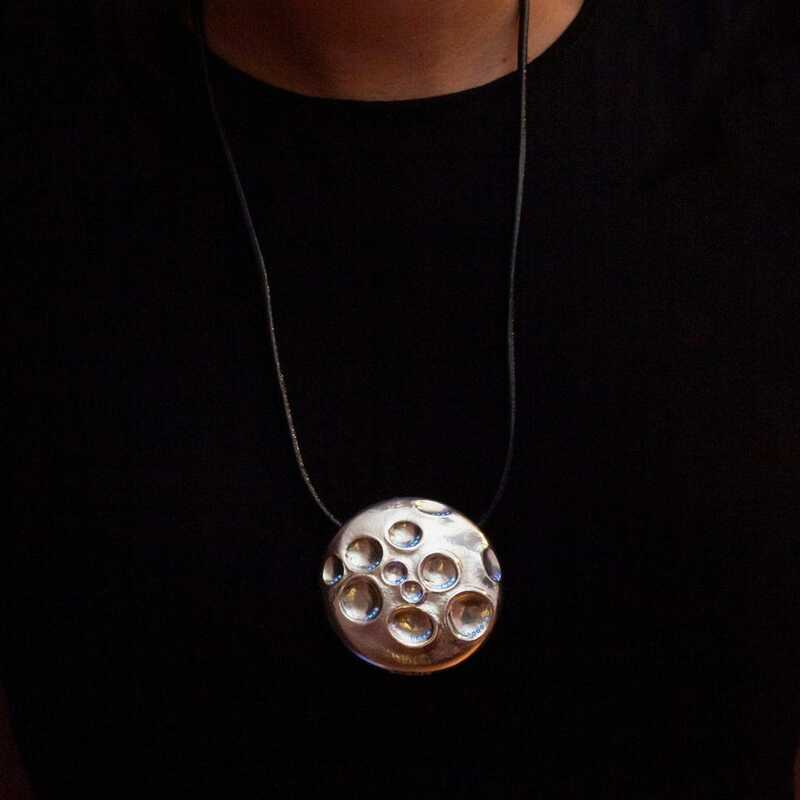 While a certain number of diamonds and colored stones visibly fluoresce when illuminated by ultraviolet (UV) light, jewelry designer Cora Sheibani http://www.corasheibani.com/ is the first to produce a luxury jewelry collection based around the powerful visual properties of fluorescent gems. 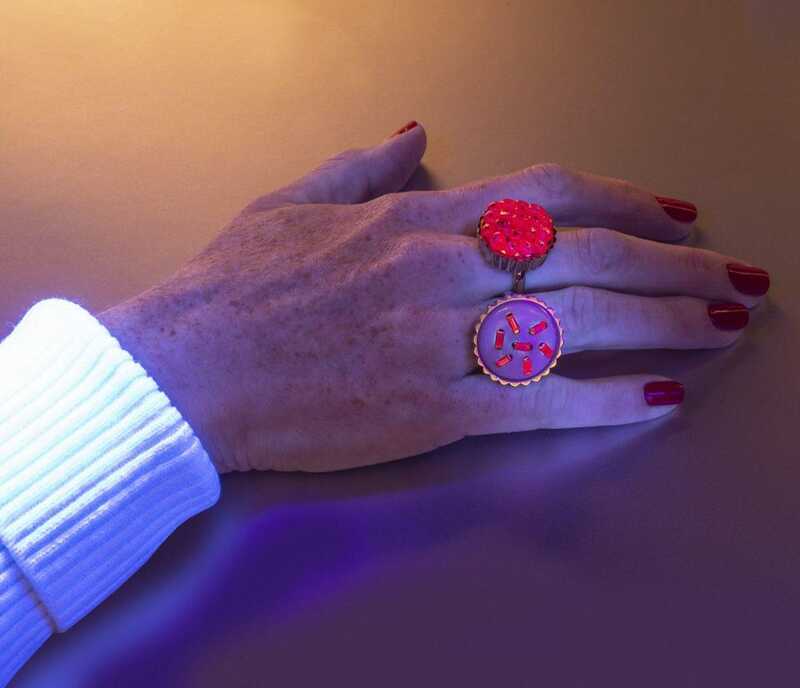 What's more, the London-based connoisseur of fluorescent diamonds and colored stones is also the creative brain powering Glow: Jewels that Fluoresce, her UV-illuminated solo jewelry exhibition at London’s Louisa Guinness Gallery https://www.louisaguinnessgallery.com/home/ . The lusciously luminous Glow show runs March 5 to April 30, 2019. While Cora Sheibani's lusciously luminous "Berry" ring is rich in rubies, the pink opal and spinel-sprinkled "Cupcake" ring is also on exhibit at Louisa Guinness's gallery on Conduit Street until April 30, 2019. 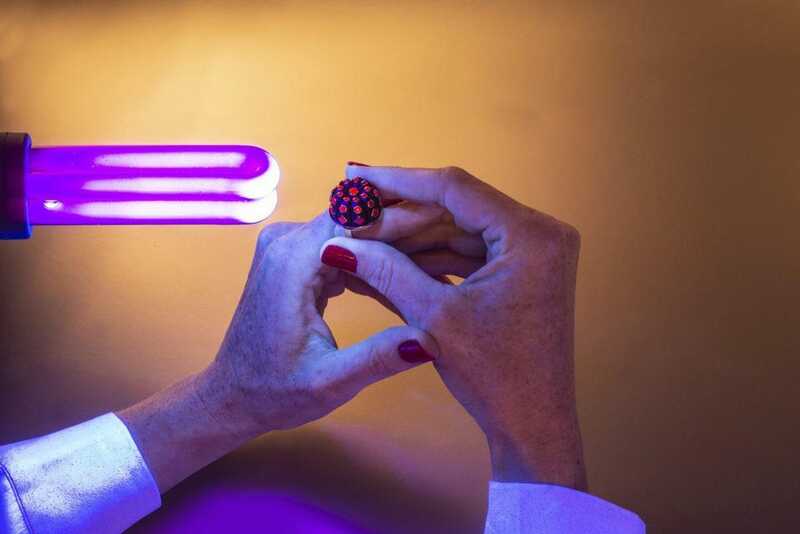 All of the jewels appearing in Glow have been designed with consideration as to how the gemstones’ colors will appear under normal lighting, as well as when exposed to UV lighting. Like all other jewels in Sheibani’s highly luxurious oeuvre, the Glow pieces are handmade by master artisans, mostly in Switzerland, but also in France, Germany and the United Kingdom. Cora Sheibani's one-of-a-kind, upmarket fluorescent Glow jewels illuminate and delineate new territory in jewelry history. By uniting new design concepts with impeccable artisanship, Sheibani creates precious adornments that when exposed to UV lighting, radiate an alluring and rare luminosity. Although many minerals fluoresce or phosphoresce, only a small number of durable gemstones show these special properties. For instance, Sheibani details, “All pink and red spinels, rubies and pink sapphires fluoresce an intense red color. A small number of yellow sapphires turn orange and only a few blue sapphires can turn red.” Brown diamonds,” she explains, “usually fluoresce white and most yellow and white diamonds fluoresce blue when exposed to UV light. Scoping out gems on Instagram, Sheibani discovered that the most intensely pink spinels from the Mansin mine in Burma are referred to as “Jedi spinel” by local dealers. Sheibani explains, “Their bright fluorescence reminds them of the glowing lightsabers wielded by Jedi warriors in the Star Wars film franchise,” she notes with an amused smile. Fluorescence in diamonds is caused by the presence of nitrogen atoms. This diamond pendant glows rather like moonlight, and is one of many compellingly beautiful pieces in Sheibani's Glow collection. To create maximum fluorescent effects in the Glow exhibition, part of Guinness’s gallery space comprises a dark-as-midnight, site-specific installation illuminated by handheld and other UV lights. In this environment, visitors enjoy the wonderful opportunity to examine each unique piece of glowing jewelry alongside vibrantly fluorescent and phosphorescent minerals that emit varying intensities of light. Besides comprising a visually captivating concept for an upmarket jewelry collection and its gallery show, Glow is also a nomadic project. In Spring 2019, it travels across the Atlantic Ocean to New York, where it will be shown from May 16 to May 23, 2019 at the Colnaghi Gallery http://www.colnaghi.com/ at 38 East 70th Street, NY 10021. Featuring a selection of fluorescent jewels by Sheibani which are in production at the time of this writing, this brief show will also display pieces from the Louisa Guinness Gallery jewelry collection by Alexander Calder, Jeff Koons and Anish Kapoor.